Jenny and her city-mouse friends take to the seas in search of a more peaceful place to live. But when they arrive at what first seems the island of their dreams, they have a giant problem to contend with: the island's only inhabitant, the skog. Judging by his enormous footprints, he seems a threat. What will the mice do? The design challenge will be to construct a trap in order to catch the skog. Extensions: - Write a letter to a family member explaining what happened on the island. Writing: What do you think a skog looks like? 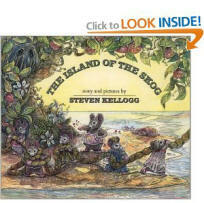 What is a skog?